from outside of Japan . 27 million people for one year . Admission fee is 300 yen . Fushimi Inari Shrine , 1,000 Torii Gate . of JAN . Free admission . Four Seasons Hotel will show up in 2016 . 230 yen for one time ride. You better ask at the restaurant . 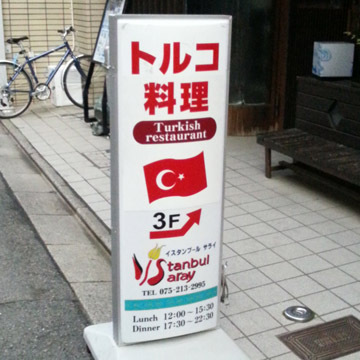 There are many HALAL restaurants which show HALAL Mark . There is 1 MOSK . "KYO -TO" means capital city. 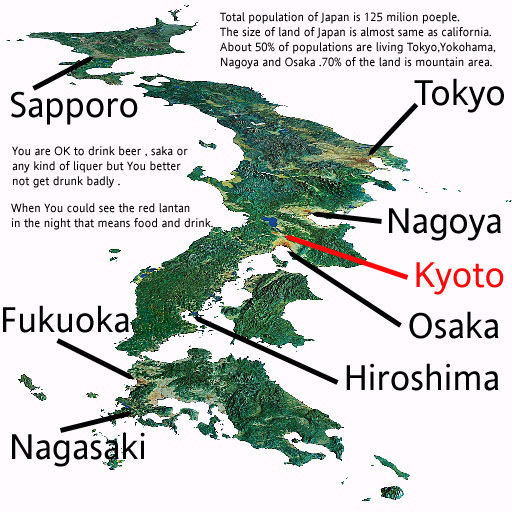 KYOTO was the capital city for 1250 years about 150 years ago . "TOU-KYO-TO" means eastern capital city . New Government moved the capital to the east from the west. "TOU" means the east in "OnYomi" pronunciation. "HIGASHI" is also same meaning but in "Kun Yomi" pronunciation .
" Yomi " means reading .
" On Yomi " is alike a Chinese pronunciation .
" Kun Yomi" is an original pronunciation of Ancient Japanese people. So that in Japanese , there are 2 pronunciations in one character. At beginning of ancient Japan , People had a dialogue in " Kun Yomi " pronunciation. Soon or later those are merged into one language . Students normally go to many kind of after school . Piano lesson, Swimming lesson. Math class and many others. so that English class normally become reading and writing only . which means students do not have any listening capability. Japanese people have difficulty to talk in English . Spring vacation starts normally from 24th of March to 7th of April . There is not any janitor in school . All of student must clean up their school and class room. When if you have to save time then you better use a TAXI which is the cheapest fare in JAPAN. BUS is cheap but takes a lot of time . It takes about double compare with taxi. from KANSAI International Airport to KYOTO . There are 2 choices . It takes about 2 hours to get Kyoto including waiting time . It takes about 3 hours to get Kyoto including waiting time . You can take a bus which is running every hours . Its takes about 1.5 hour to your place. Need a prior reservation . They take you to the where you pointed . 3500 yen for one person . you have a chance for named " Yuttari Plan" Shuttle taxi. It is 25,000 yen for one mini Van taxi which can be managed up to 9 people and takes you at where you pointed. This takes about 1.5 hours to your place including waiting time . No way . It will take for 2 days at least . 110km !!! You better ask your agent. There was a landing spot at east side of Kyoto. This takes about 30 minutes flight time to get Kyoto . There are some HALAL restaurants . It takes about for 1 hour by JR, Hankyu,Keihan and Kintetsu　. Distance is about 40km to South West facing Osaka Bay. It takes about for 1 hour by JR and Kintetsu railway . Distance is about 40km to South facing Mt.KOUYA . This is the CIA Library about Japan.